The KC-130 is a multi-role, multi-mission tactical tanker/transport which provides the support required by Marine Air Ground Task Forces. This versatile asset provides in-flight refueling to both tactical aircraft and helicopters as well as rapid ground refueling when required. 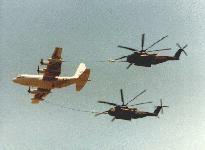 Additional tasks performed are aerial delivery of troops and cargo, emergency resupply into unimproved landing zones within the objective or battle area, airborne Direct Air Support Center, emergency medevac, tactical insertion of combat troops and equipment, evacuation missions, and support as required of special operations capable Marine Air Ground Task Forces. The KC-130 is equipped with a removable 3600 gallon (136.26 hectoliter) stainless steel fuel tank that is carried inside the cargo compartment providing additional fuel when required. 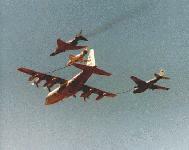 The two wing-mounted hose and drogue refueling pods each transfer up to 300 gallons per minute (1135.5 liters per minute) to two aircraft simultaneously allowing for rapid cycle times of multiple-receiver aircraft formations (a typical tanker formation of four aircraft in less than 30 minutes). 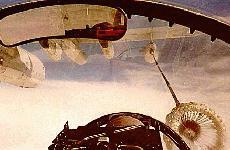 Some KC-130s are also equipped with defensive electronic and infrared countermeasures systems. Development is currently under way for the incorporation of interior/exterior night vision lighting, night vision goggle heads-up displays, global positioning system, and jam-resistant radios. 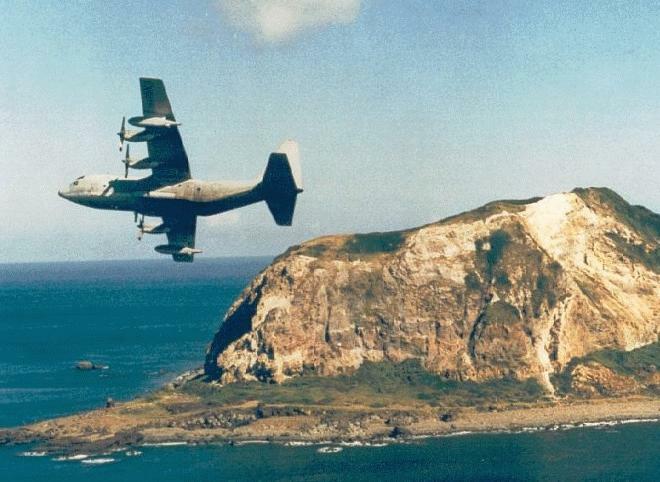 The C-130 Hercules transport aircraft, which is still in production, first flew 42 years ago and has been delivered to more than 60 countries. The C-130 operates throughout the military services fulfilling a wide range of operational missions in both peace and war situations. 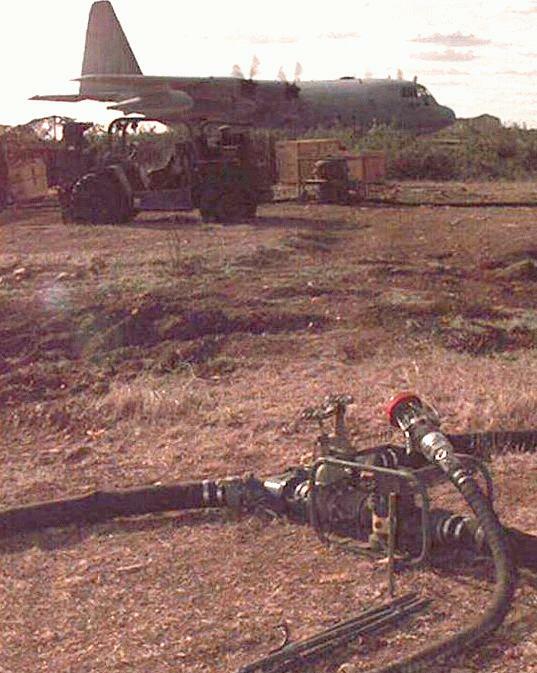 Basic and specialized versions perform a diversity of roles, including airlift support, Distant Early Warning Line and Arctic Ice re-supply, aero-medical missions, aerial spray missions, fire fighting duties for the U.S. Forest Service, and natural disaster relief missions. 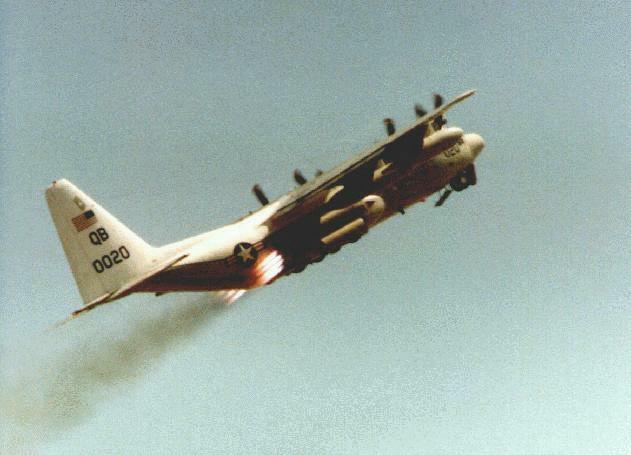 The C-130E is an extended range development of the C-130B, with large under-wing fuel tanks. A wing modification to correct fatigue and corrosion on C-130Es has extended the life of the aircraft well into the next century. The basic C-130H is generally similar to the C-130E model but has updated T56-A-T5 turboprops, a redesigned outer wing, updated avionics, and other minor improvements. While continuing to upgrade through modification, the U.S. Air Force (USAF) has budgeted to resume fleet modernization through acquisition of the C-130J version. This new model features a two-crew member flight system, Skip Allison AE2100D3 engines, all-composite Dowty R391 propellers, digital avionics and mission computers, enhanced performance, and improved reliability and maintainability. The new KC-130J, with its increase in speed, range, improved air-to-air refueling system, night systems, and survivability enhancements, will provide the MAGTF commander with a state-of-the art, multimission, tactical aerial refueler/transport well into the 21st century. The KC-130J aircraft is a medium sized transport and tanker with capability for intra-theater and inter-theater airlift and aerial refueling operations. 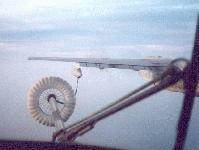 The KC-130J is capable of in-flight refueling of both fixed and rotary wing aircraft. The fuel system is a common cross-ship manifold that serves as a refueling system, a fuel supply crossfeed, a ground refueling system, and a fuel jettisoning system. It also retains the capability for worldwide delivery of combat troops, personnel, and cargo by airdrops or airland to austere, bare-base sites. 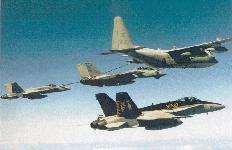 The KC-130J is capable of day, night, and adverse weather operations. The KC-130J provides rapid logistic support to operating forces. It can be configured to provide transportation of personnel or cargo. Delivery of cargo may be accomplished by parachute, low level fly-by ground extraction, or landing. As a tactical transport, the KC-130J can carry 92 ground troops or 64 paratroopers and equipment. It can be configured as a medical evacuation platform capable of carrying 74-litter patients plus attendants. 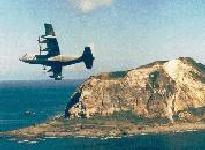 The KC-130J can land and takeoff on short runways and can be used on primitive landing strips in advanced base areas. The KC-130J is also capable of providing mission support in emergency evacuation of personnel and key equipment, advanced party reconnaissance, and special warfare operations. The KC-130J Developmental and Operational Tests were completed by Lockheed Martin Aeronautical Systems (LMAS). The Qualification Operational Test and Evaluation (QOT&E) will be conducted at Naval Air Station (NAS) Patuxent River, Maryland, in late FY00 through late FY01. Beginning in FY96, the USAF started procuring the C-130J as the replacement for the their older C-130E and C-130H. 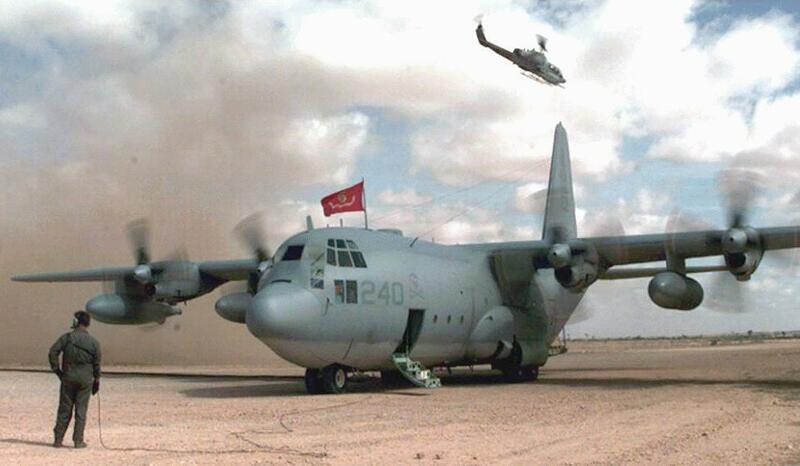 The U.S. Marine Corps (USMC) will receive five KC-130Js through an ECP to the USAF contract. 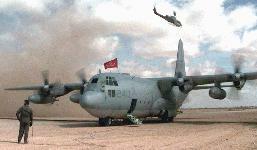 The USMC KC-130J is scheduled to replace the KC-130F model aircraft. Although currently only five aircraft are under contract, additional procurements in future years are planned, but no schedule has been established. The initial procurement of five KC-130Js will replace the oldest F models. These KC-130Js will be assigned to Marine Aerial Refueler Transport Training Squadron (VMGRT)-253 at Marine Corps Air Station (MCAS) Cherry Point, North Carolina. The KC-130J major enhancements include advanced, two-pilot flight station with fully integrated digital avionics, MIL-STD 1553B data bus architecture, color multifunctional liquid crystal displays, and head-up displays. Additional enhancements include state-of-the-art navigation systems with dual embedded Global Positioning System, Inertial Navigation System, mission planning system, low power color radar, digital map display, and new digital autopilot. 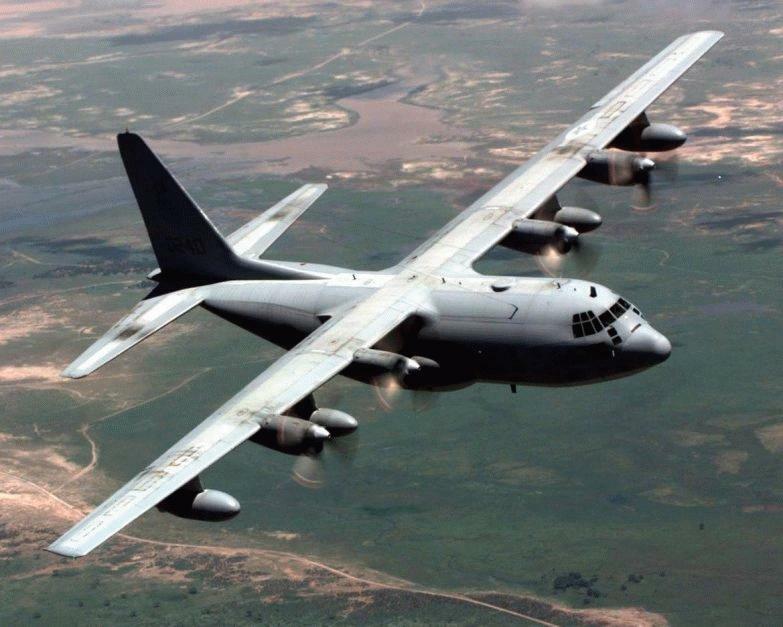 The KC-130J incorporates extensive Built-In Test (BIT) integrated diagnostics with an advisory, caution, and warning system, and new higher power turboprop engines with more efficient six-bladed all-composite propellers. VMGR-152 REFUELS WING'S LONG-RANGE CAPABILITIES Marine Corps News 04 May 1999 -- KC-130s can refuel two other aircraft at once. 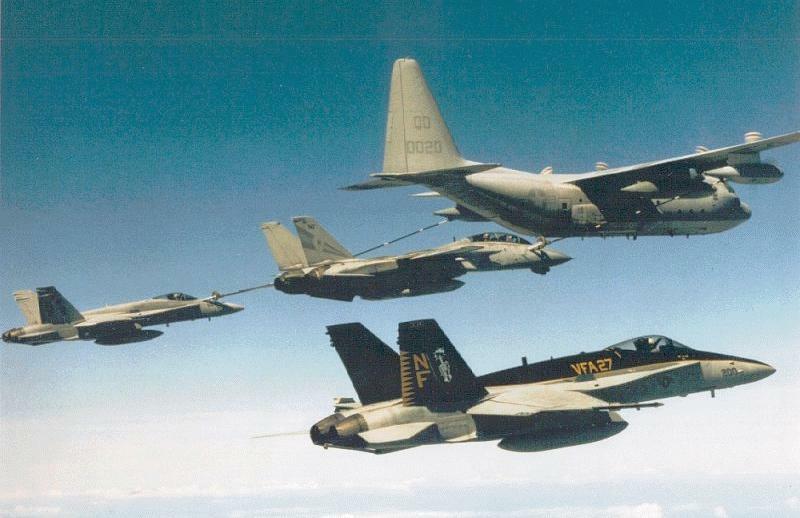 The fastest the KC-130 can be traveling while refueling fixed wing aircraft is 250 knots, and 120 knots when refueling helicopters.